Exfoliation removes dead cells from the skin's surface to improve its appearance and to prevent clogged pores and acne. It may also help combat the signs of aging by removing dull and damaged skin and encouraging the growth of new, healthy skin. Exfoliating gloves are designed for use with or without exfoliant scrubs, and most can be used on every part of your body. They are especially beneficial for exfoliating the legs and other large areas where using a small sponge may be too time-consuming and scrubs may be too expensive. Choose gloves that are lightweight and fit your hands comfortably. Avoid very rough gloves, because these may damage your skin. Try on exfoliating gloves before purchasing to ensure they fit properly. Wet the gloves and your skin with warm water. 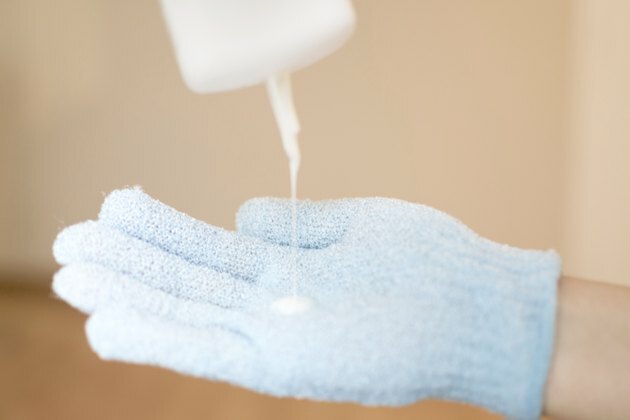 Apply a few drops of liquid soap or exfoliant scrub directly to the gloves or to your skin. Add more water if necessary to form a lather. Massage your skin using gentle pressure. Move the gloves over your skin in small, circular motions. Do not use exfoliating gloves on sensitive areas, such as near the eyes. 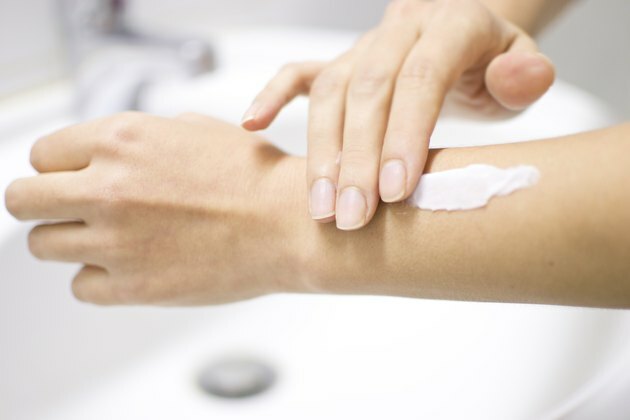 If you experience any redness, stinging, burning or pain, stop using the gloves and wait for your skin to recover before attempting to exfoliate again. 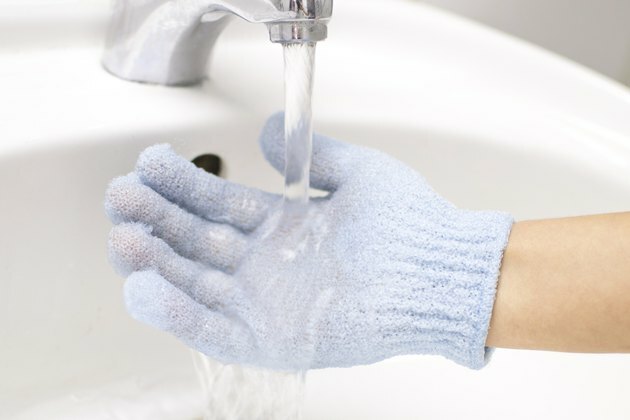 Rinse the gloves often while exfoliating to wash away dead skin cells or other debris. Add more soap or exfoliant as needed. Moisturize within three minutes of exfoliating and rinsing. Exfoliating your skin can increase dryness and irritation. Moisturizing creams or lotions will lock water into your skin, soothe irritation and prevent dryness or itching. Clean and dry your gloves per the care instructions on the package. 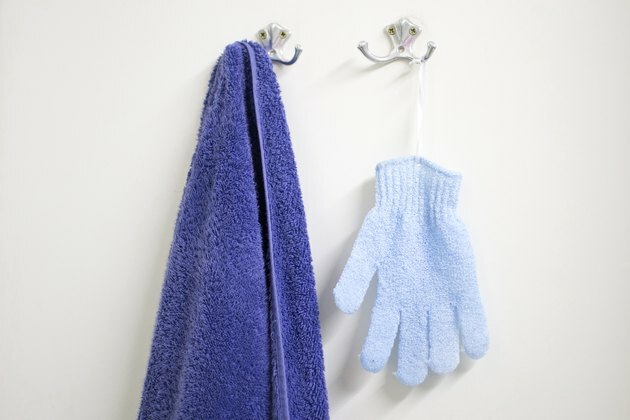 Some gloves are suitable for machine washing, while others must be hand washed and hung to dry. Exfoliate only once or twice each week. 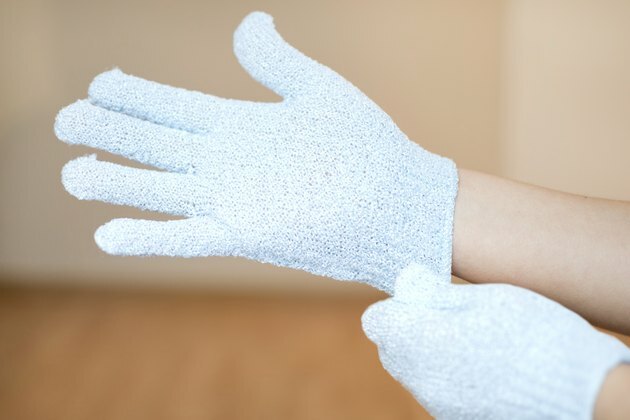 Using your exfoliating gloves more often or applying too much pressure during exfoliation may cause significant skin irritation and worsen acne and other skin conditions, according to the American Academy of Dermatology. Because exfoliation removes the top layer of your skin, it makes you more vulnerable to sunburn and sun damage. Wear a sunscreen every time you go outside. Do not store your gloves wet. Doing so encourages the growth of bacteria and fungus and increases your risk of developing an infection.